Oma’s Sour Cream Chicken | Mommy, I'm Hungy!! I haven’t posted the last couple of days’ recipes due to a sever sinus headache/migraine yesterday. Needless to say, I didn’t cook anything last night. I was able to get a little quiet time to myself last night, because my parents went out to dinner and took Cheyenne with them. So I was able to lay down in a quiet room for about an hour and just rest. They brought me some dinner back and I managed to eat it slowly but surely between waves of nausea. So today, I am feeling better and can finally post what I’ve fixed the last few nights. I made a yummy meal the other night that everyone loved! Even Cheyenne ate quite a bit and loved it! I love hearing “Mommy you make good chicken!” or whatever we’re eating when she eats the meals I fix. I used tenderloins because I didn’t have any breasts when I went to take some chicken out to thaw. It was really good and I think I’ll use breasts next time and see how that turns out. 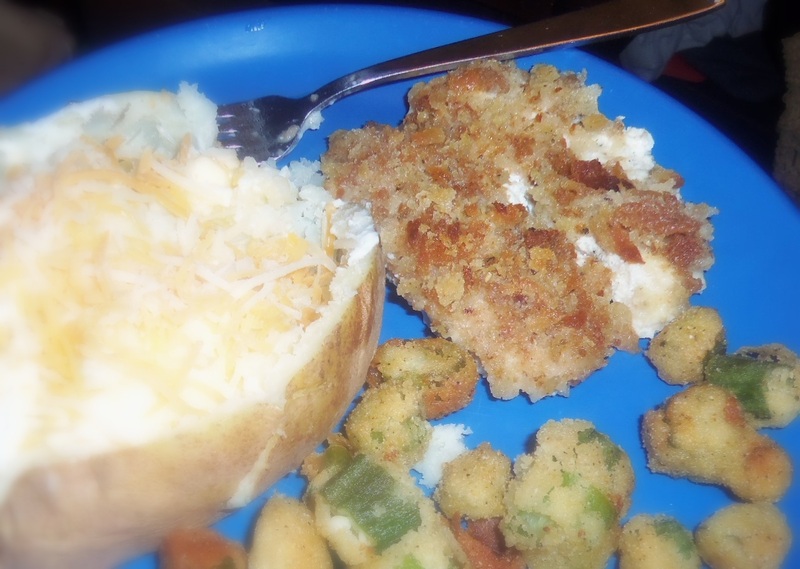 I made baked potatoes and okra to go along with this delicious chicken and I will definitely be making this again! Let me know if you get a chance to make this and how your family likes it!